Beenham Wind Orchestra: Calling all Band Children! 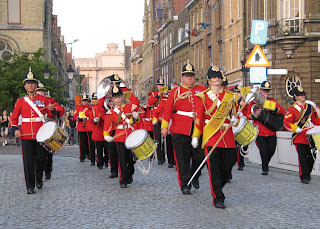 Do any of you have any children (aged 12-18) who play a brass or woodwind instrument or percussion who would like to join with the Berkshire and Hampshire Army Cadet Force Bands for their trip to Holland from 13 - 20 August? We have a few spare spaces for youngsters - cost £150 all inclusive apart from pocket money. Accommodation at barracks in Arnhem and we will be playing at Menin Gate on the way home. Tom, Tony, Charlie, Nicola (cornet) and Louise will be going. If you're interested see me at Band on Friday. Pic: Combined Berks and Hants ACF Bands marching from Menin Gate last year (Tom is on the left) - click to enlarge. Gosh, what stunning uniforms! Really impressive for a sense of occasion. Hope you find some takers.